WE BELIEVE IN THE POWER OF ART TO ENRICH THE LIVES OF ALL. ENJOY THE EXPERIENCE. 10am to 5pm, every day except Christmas Day. Open until 9pm on the first Friday of each month. 10am to 4.45pm, every day except Christmas Day. 9am to 4.30pm, every day except Christmas Day. Before 10am, enter through the Sculpture Courtyard or Fish Gate entrances. General entry is free. Charges may apply for some exhibitions. For the benefit of visitors and to preserve works of art, smoking, food and drink are not permitted in the Gallery. Large bags, backpacks and umbrellas must not be carried in the Gallery. Instead, leave them at the free cloakrooms conveniently located near both main entrances. Gallery staff are happy to advise on what you can carry with you. And of course, don’t touch the art. Visitors may take photographs using hand-held devices for personal use. In some gallery spaces, photography may be restricted and will be advised by staff and signage at the entrance of the exhibition. Filming and the use of tripods, flash and additional lighting is not permitted without permission from the Art Gallery of South Australia. To request the use of photographic equipment or seek media access, please contact the Gallery’s Communications team. For more information, refer to our Photography in the Gallery Policy. 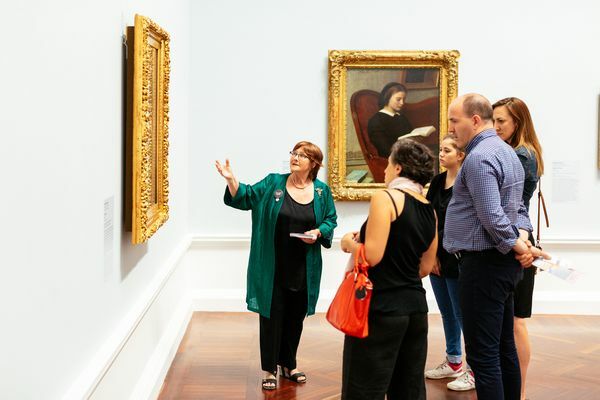 The Art Gallery of South Australia, founded in 1881, is home to one of Australia’s great art collections, exhibited in one of Adelaide’s most beautiful buildings. It is visited by more than one million art lovers each year. 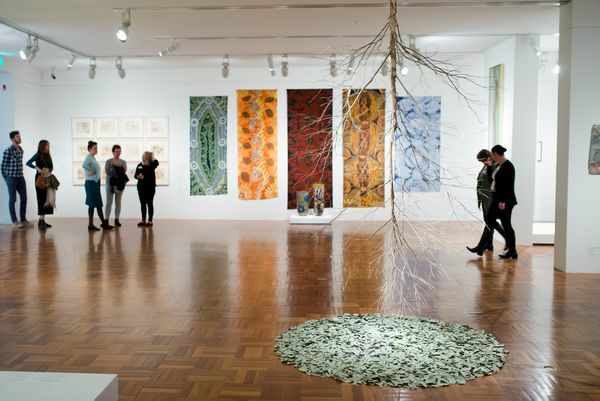 The Gallery is located at the heart of North Terrace, Adelaide’s cultural boulevard, between the South Australian Museum and the University of Adelaide. Numerous bus routes [routes 97, 98, 99, 170, 171, 172, 174, 176, 178, 281, 286, 287, 288, 613, 626, 630] run on North Terrace. Alight near Pulteney Street at stop T1 (westbound) or G1 (eastbound), right outside the Gallery. If your bus runs on nearby Grenfell Street, alight near Pulteney Street and walk 250 metres north to North Terrace. If your bus runs on King William Street, alight near North Terrace and walk 450 metres east. Adelaide Railway Station is a five-minute walk from the Gallery. Exit the station, turn left onto North Terrace and walk east 600 metres. Trams run frequently along North Terrace. Alight at either Art Gallery or University of Adelaide stops and walk 125 metres. On-street parking and numerous commercial off-street carparks are available nearby. Gallery visitors may receive discounted fees at Wilson Parking on North Terrace, opposite the Gallery – ensure you get your carpark ticket stamped at the Information Desk in the Atrium at the Gallery. Bicycle parking is available 10 metres to the west of the Gallery’s main entrance. The nearest taxi ranks are on Pulteney Street near Rundle Mall (300 metres from the Gallery) and on North Terrace outside the Railway Station and Casino (approximately 500 metres west of the Gallery). Art Gallery of South Australia Kaurna yartangka yuwanthi. Ngadlu Kaurna miyurna parna yaitya mathanya Wama Tarntanyaku tampinthi. Ngadlu yaitya mathanya kumarta yartanangku Tidna Wirltunangku, warrunangku kuma tampinthi. Art Gallery of South Australia stands on Kaurna land. We recognise Kaurna people as the custodians of the Adelaide Plains. We also recognise the Indigenous custodians from other parts of Australia and from overseas. Thank you to Kaurna Warra Karrpanthi Aboriginal Corporation for kindly providing the Kaurna translations on this website. Making art accessible to all. A popular and exclusive way to engage with our collection and exhibitions. Select from a range of books, gifts and unique creative pieces in the Gallery or online.